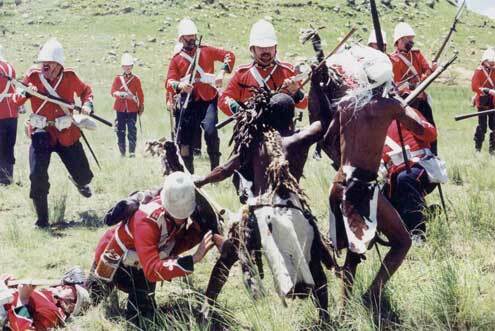 The Anglo-Zulu War was fought in 1879 between the British Empire and the Zulu Empire. From complex beginnings, the war is notable for several particularly bloody battles, as well as for being a landmark in the timeline of colonialism in the region. 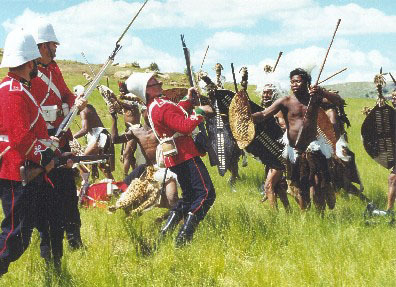 This was a decisive six-month war in eastern South Africa, which resulted in a British victory over the Zulus. Before the war the Tugela River formed the boundary between Zululand and the British colony of Natal. Cetshwayo became king of the Zulus in the early 1870s. 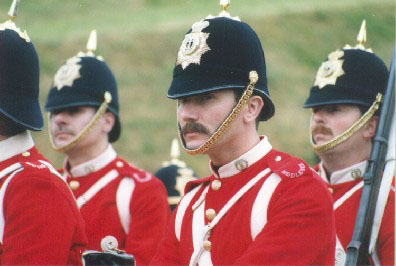 Unwilling to submit to British hegemony, he assembled a well-disciplined army of 40,000 to 60,000 men. Late in 1878 he received an ultimatum from Natal to disband his army and pay reparations for alleged insults. When he did not respond, British troops invaded under the leadership of Lord Chelmsford. 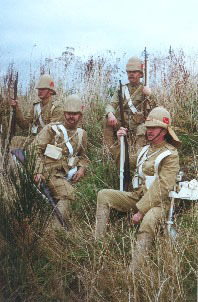 Although the January 1879 rains impeded travel and the tall grasses of Zululand blocked their view, the invaders advanced into Zululand without taking normal precautions (such as scouts and sentries). 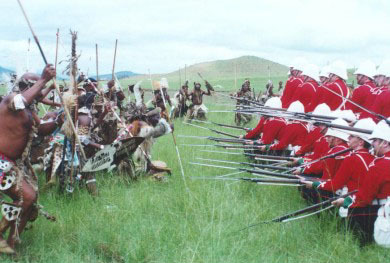 The Zulu army attacked and annihilated the central British column at Isandhlwana, killing 800 British soldiers and taking nearly 1,000 rifles, with ammunition. 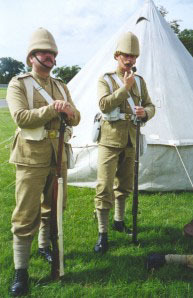 Later, British reinforcements arrived and Cetshwayo fled. The British advantage met a setback in April with the unsolicited arrival of a French prince, Napoleon III?s son, in search of adventure. He joined a British expedition, underestimated the enemy, and was killed in a surprise attack in May. His death was an embarrassment for the British, who had been unable to protect him. Their victories continued, nevertheless. In July Cetshwayo was decisively defeated at Ulundi. 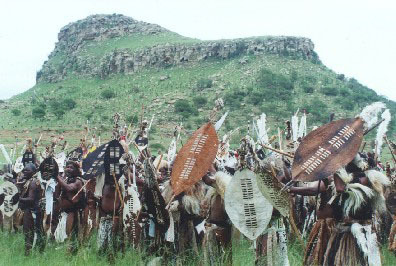 Zululand then came under informal British control. It was annexed to Natal in 1887. The Spanish American War, a time of great change and the United States moving to the forefront of world power. Teddy Roosevelt charging up the San Juan Heights, the Rough Riders and the sinking of the battleship, the U.S.S. Maine - these are what people commonly know about the United States' war with Spain in 1898. What they may not remember is that this was the war that steered the United States to center stage as a world power. Victorious over Spain in Cuba and the Philippines, the United States, a nation founded in opposition to imperialism, grappled with its new role as an imperial power. The Span-Am War (as it is often called) was an armed military conflict between Spain and the United States that took place between April and August 1898, over the issues of the liberation of Cuba. The revolution in Havana prompted the United States to send in a warship, the U.S.S. Maine to indicate high national interest. Tension among the American people was raised because of the explosion of the U.S.S. Maine, and the yellow journalist newspapers that accused the Spanish of oppression in their colonies, agitating American public opinion. The war began after American demands for the resolution of the Cuban fight for independence were rejected by Spain. Strong expansionist sentiment in the United States motivated the government to develop a plan for annexation of Spain's remaining overseas territories including the Philippines, Puerto Rico, and Guam. The war ended after victories for the United States in the Philippine Islands and Cuba. On December 10, 1898, the signing of the Treaty of Paris gave the United States control of Cuba, the Philippines, Puerto Rico, and Guam. The National Indian Wars Association Inc. © Non-profit Organization, located in California. 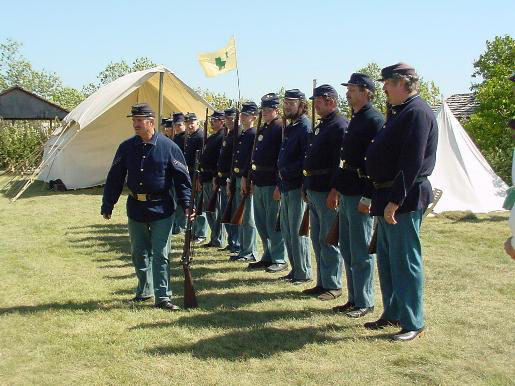 The purpose of the National Indian Wars Association, Inc. is to contribute to the education of the American public about this critical period of our Nation's history (1865-1890), known as the Indian Wars period. 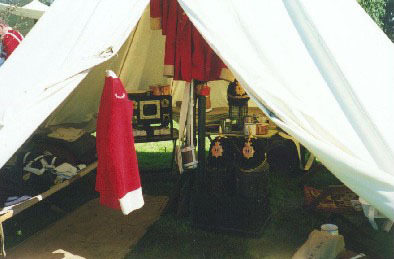 Frontier Soldiers Association The Frontier Soldiers Association, an affiliate of the Northwest Historical Military Society, is a living history group dedicated to accurately representing the average American soldier from 1872 to 1891 era, with particular emphasis on the Sioux Campaign of 1876. The Buffalo Soldiers of Seattle The Buffalo Soldiers of Seattle, a non-profit organization, was founded in 1994 by the late Mr. Al Wilcher and local horsemen interested in transmitting their skills, historic knowledge and expertise to local youth. 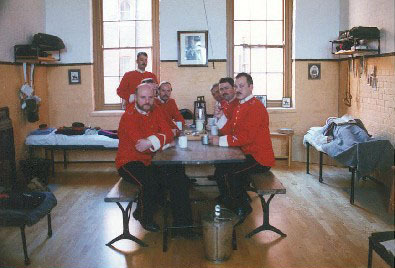 The General Miles Marching and Chowder Society The General Miles Marching and Chowder Society, formed in 1979, is a group of military historians with a deep interest in the lives of the enlisted infantrymen of the regular army in the west, 1867-1890. 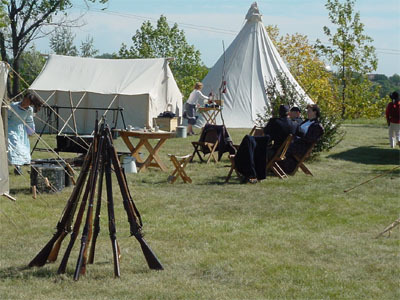 The Old West Living History Foundation We're a national/international organization of living history enthusiasts & participants who celebrate the spirit & legends of the 1800?s American Frontier. 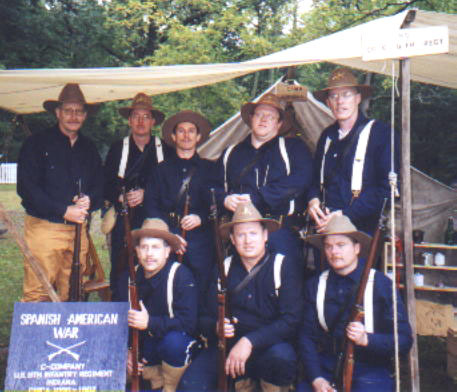 American Federation of Old West Reenactors The American Federation of Old West Reenactors is the premier sanctioning body of group and individual reenactors. 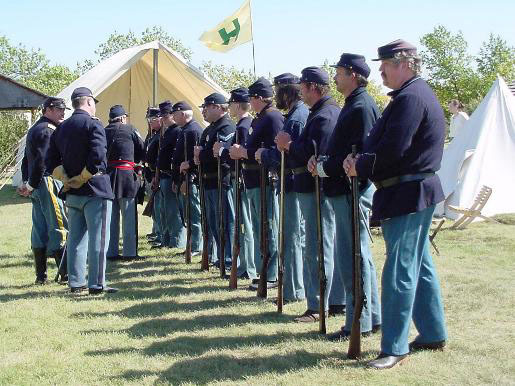 We are a national non-profit organization open exclusively to those groups and individuals that are committed to the highest standards of accuracy and period dress. National Outlaw/Lawman Association A national and international association of old west reenactor groups. Bad Company Theatrical Productions Inc. Bad Company Western Theatrical Productions is a 16-year-old, non-profit corporation committed to the preservation of the Wild West, from 1849 to the 1880's its history and Glory. An executive board of elected officials with 39 insured members governs us. 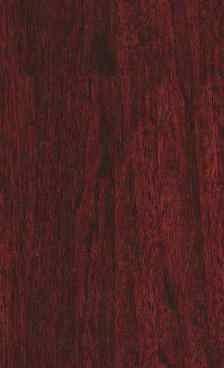 We are based in The Sierra Nevada foothill region, in Northern California's beautiful Gold Country. 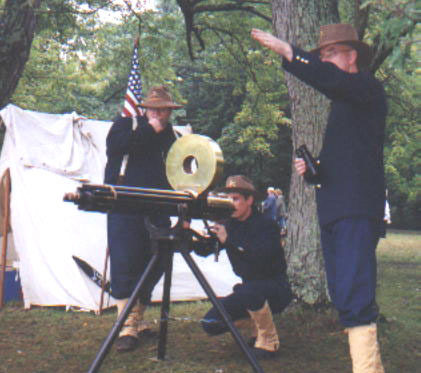 United Spanish American War Society The United Spanish American War Society is a national non-profit organization of living history participants dedicated to authentically portraying the Spanish American War of April to August 1998 for the education of its members and the interested public. 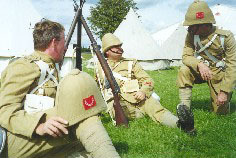 The Spanish War 1898, Inc. 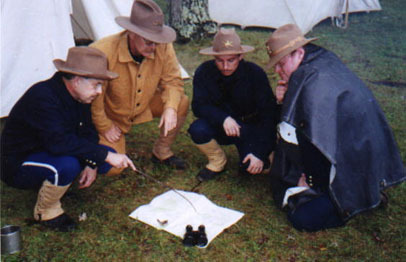 It is the primary goal of 'The Spanish War 1898 Inc.' to authentically portray the period of the Spanish American War for the education of its members and the interested public. If you wish to advertise on our site, please click here!